We built our house and we wanted to let our children know that everything we did, as parents, as humans, was meant to stand on the belief that from God, and God alone, came the structure of everything else. So we had a little ceremony, just the five of us, each of us humbly praying for our home and those in it to always stand on the rock that God is. We’ve tried to live always standing firmly on that foundation of our faith; sometimes we accomplish it and other times we don’t. Sometimes it’s easy and sometimes it isn’t. I was reminded of that small, private ceremony the other day, when my daughter called out to me on Labor Day that the tree house was falling over. As you can see in the photo above, it’s hanging precariously, wedged in by a few trees, and those trees are all that’s keeping it from crashing down. I’m literally just praying that it doesn’t cause one of the trees to snap and crash into the back of the house. One of the floor joist pieces had rotted, and that’s all it took for the entire thing to begin to list. 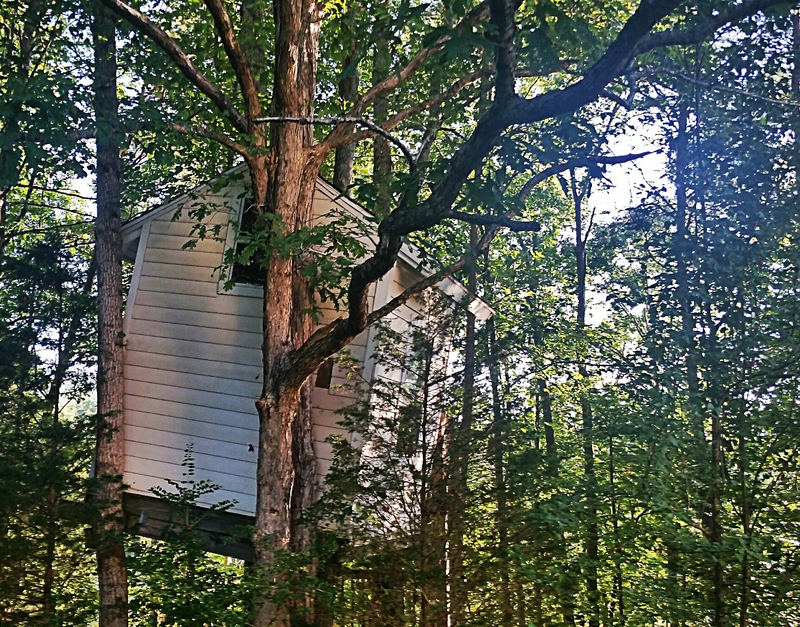 This tree house was a labor of love that took much, much longer than it should have. And much, much more money than it should have. What started out to be just a fun family project using up leftover scraps of wood, roofing, and siding that had been laying around the house for a few years, became an all-consuming task that ate up weekends and months and perhaps even years. We finished it just about the time our kids were a little too old to want to go hang out in a tree house, sadly. They still played in it – a bit – but not with the fervor that they had anticipated when we started building it. Sometimes they went out to read Artemis Fowl books or just get away when they needed time to cool down from an argument with someone in the house, but it wasn’t used the way it was intended to be used. And really, with our kids grown, we haven’t been particularly strict about maintaining it to the same degree we do our house house. Which all got me to thinking about building one’s house on the rock. There’s a reason foundations are made of durable, lasting material: a foundation is meant to hold everything else up. Even with a strong foundation, things just can’t be forgotten and not maintained. We need to do our part. We can put our hope and trust in our foundation, but we can’t just let things go by the wayside without keeping an eye that it remains intact. Floods and winds and rains do come, and even small amounts of sediment surrounding the foundation can seep away. I believe everything in life is God-breathed. Everything I see, say, do, hear, watch, read…. He’s showing me something. He’s teaching me something. What a beautiful, tangible reminder. Thanks for this elegantly written post. May I reblog it on my blog, Parenting With a Smile? Most certainly, Linda. You’re very kind. Thank you, Christine! I have it scheduled for next Tuesday. Thank you so much Linda – that was so very nice of you to repost it! Excellent read to start my Sunday!